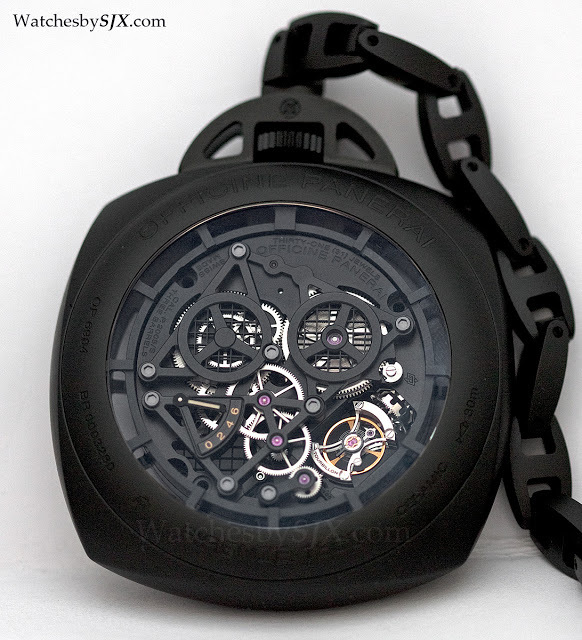 Panerai’s first pocket watch is the Tourbillon GMT Ceramica PAM00446, which has a skeletonised movement featuring a tourbillon and second time zone, inside a black ceramic case. 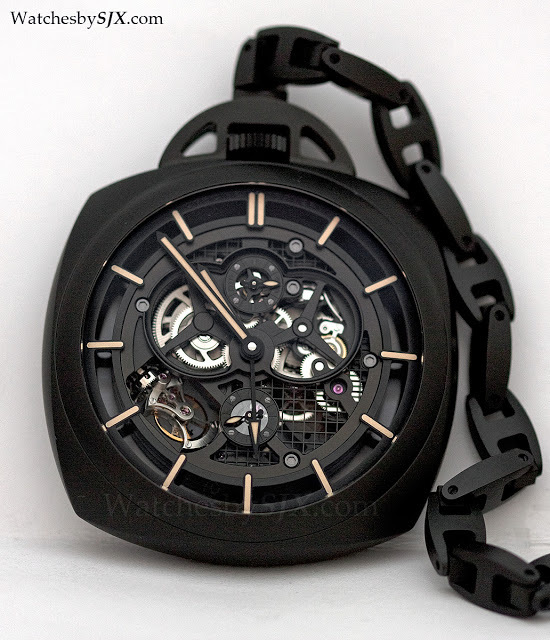 At SIHH 2013 Panerai unveiled a pocket watch, the the Tourbillon GMT Ceramica PAM446, a first for the brand. Inside is the same P.2005/S movement first used in the Radiomir Tourbillon GMT Ceramic ‘Lo Scienziato’ PAM348 unveiled in 2010. The PAM446 pocket watch, as well as its cousin the Lo Scienzato, are Panerai’s most costly modern timepieces, marking the peak of its pricing power. This is probably the last we will see of complications with six figure price tags from Panerai, at least for a while, as the watch market cools down. In fact, Panerai is now going in the opposite direction. Measuring 59 mm wide, the PAM446 is impractical for actual use, but makes an impressive desktop accessory – it is supplied with a desk support to turn it into a desk clock. 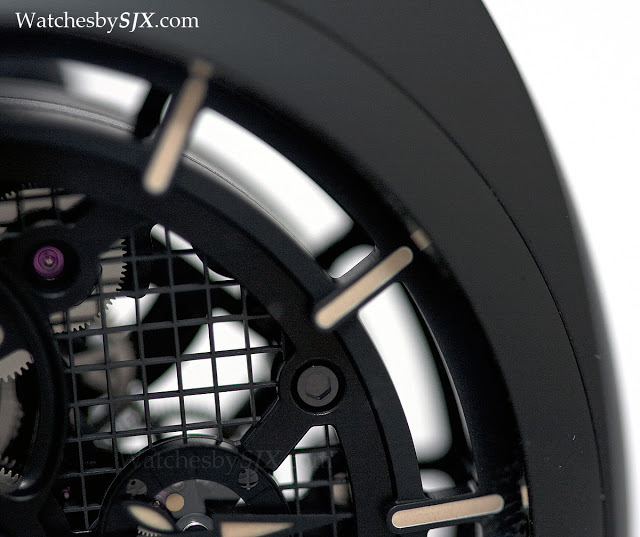 The case is black ceramic, as is the watch chain. 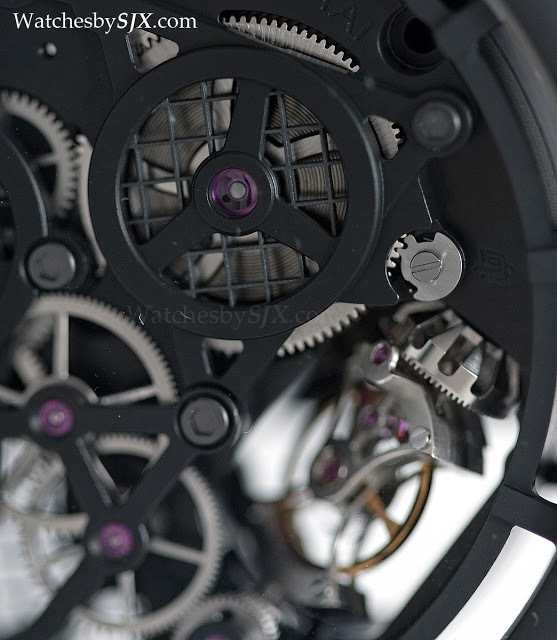 The P.2005/S movement is an extremely large calibre at 16 3/4 lignes, or about 38 mm. All the bridges have a black PVD finish, and are open-worked in a slightly steampunk, industrial style, including a mesh base plate. The movement does not reveal much in the vein of traditional high-end decoration, but then that would be incongruous with the sensibility of this pocket watch. All the skeleton indices – you can see right past them – are actually supports for the movement, securing it to the case. 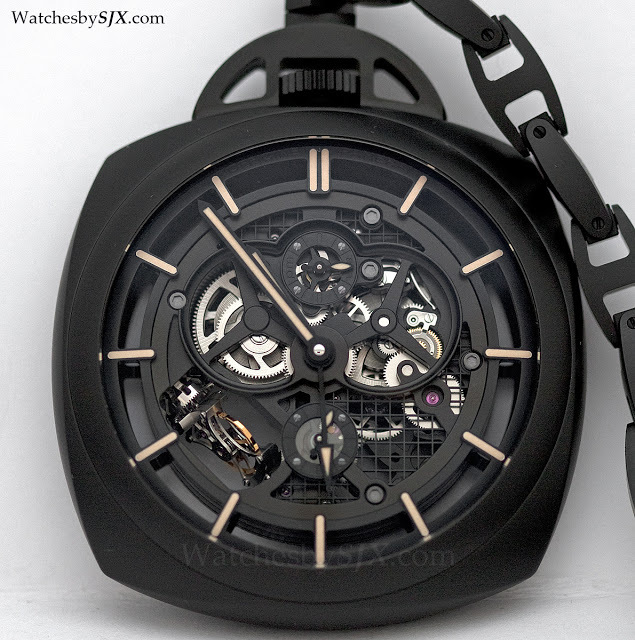 Stylistically this is similar to the Cartier Grand Complication Pocket Watch shown at SIHH last year. 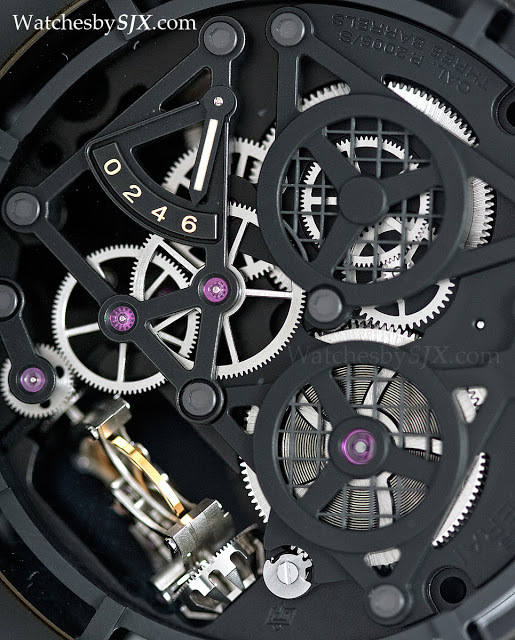 At eight o’clock is the unusual Panerai tourbillon regulator. 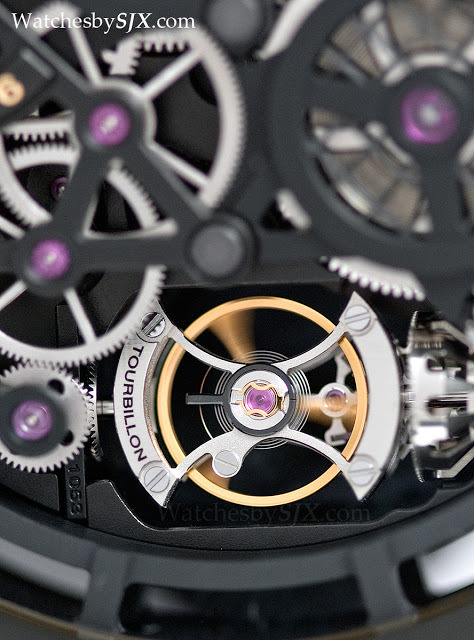 Unlike most tourbillons which have the axes of the balance and tourbillon carriage on the same plane, the Panerai tourbillon carriage rotates on a plane perpendicular to the balance wheel, akin to a horizontal rotisserie. 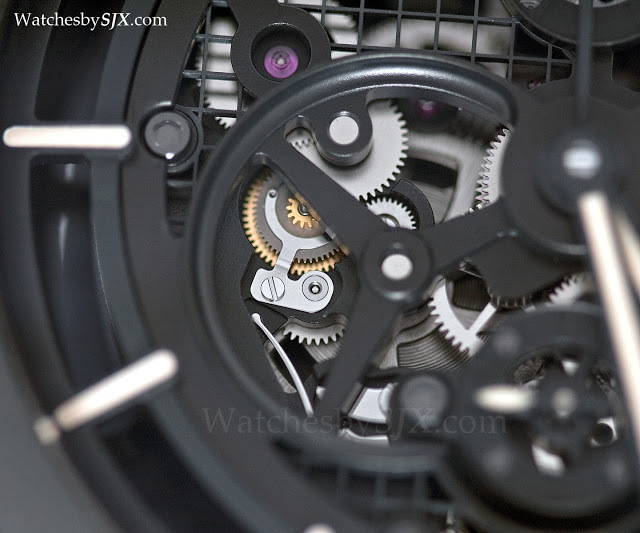 And it is a 30 second tourbillon, making two rotations a minute. The sub-seconds is at six o’clock and because the watch has a GMT hand, the 24 indicator for the second time zone is at 12. Over on the back is the power reserve indicator, which tops out at six days, thanks to its three barrels.